How Fast Can I Drive in 4WD? Some drivers worry about the speed at which they can safely drive their 4WD vehicles. This is a natural concern since the reasoning is that with more components (extra driveshaft) and gears engaged, it puts more strain on the engine and limits the RPMs. There are a few factors that determine the maximum speed of 4WD operation. First and foremost, the driver who has control over the vehicle will always determine the speed of the vehicle. Most high-speed accidents result from driver error, not component malfunction. This means driving at or under the posted speed limit, especially under the limit when the conditions are not favorable, is preferred. Ice/sleet, snow and wet roads will always make the roads more hazardous to negotiate, causing slipping and skidding, and this is magnified at higher speeds. 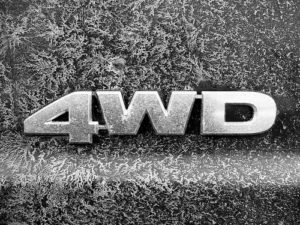 AWD (all wheel drive) and regular 4WD allow for more stability and traction on uneven or slippery surfaces and make driving safer. However, they cannot defy the law of physics—going too fast means performance parameters have been exceeded for the condition involved. The general AWD and 4WD systems do not have a mechanical unsafe speed limit that will permanently damage components or negatively affect performance. The exception is the “part time” or manually operated system that allows the driver to choose between 2WD and 4WD. Part time 4WD is not as precise as regular 4WD and AWD, which are compensate automatically in function. Damage to the drive components can result when part time drive is chosen for dry, smooth surfaces. Also, it does not permit stability or traction control or ABS to function. Part time 4WD dictates that 2-wheel and 4-wheel drive be alternated between dry and slippery surfaces respectively. Using 4WD on smooth, dry surfaces at high speeds may result in serious damage to driveline components.